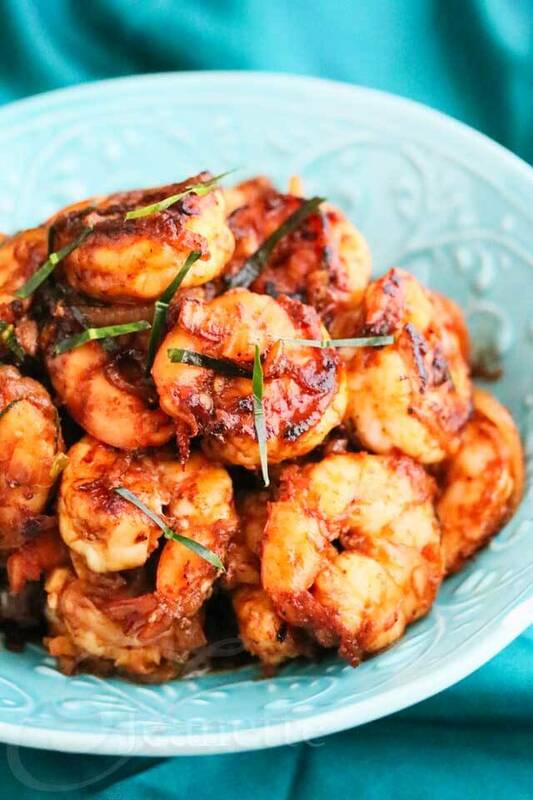 This Stir-Fry Shrimp with Thai Roasted Chili Paste is really easy to make – the trick is in the flavorful Chili Paste. 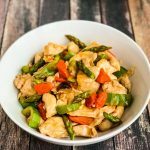 I love Thai food so when I first learned how to prepare some of my favorite Thai recipes several years ago, it was really eye-opening. I think my first experience cooking Thai food was from a class given by the chef of a local Thai restaurant. 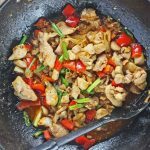 After learning about the different curry pastes, sauces and herbs used in Thai cooking, I felt confident enough to try cooking Thai food in my own kitchen. 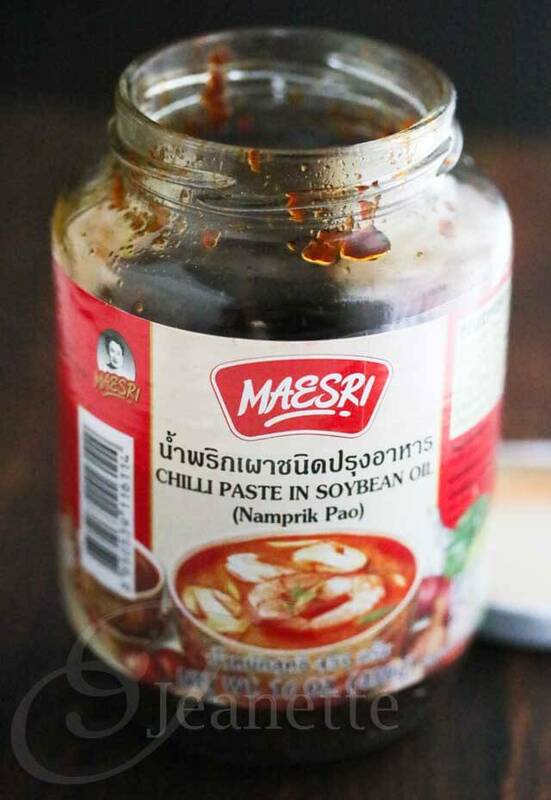 I still remember the first time I came across Thai Roasted Chili Paste – it’s nothing like the Chinese chili pastes I’ve ever tried. Thai Roasted Chili Paste is sweet and spicy and a little tangy. Made with dried chilies, tamarind juice, garlic, shallots, fish sauce, dried shrimp, sugar and salt, this is one of those pantry items that can transform almost any dish instantly. 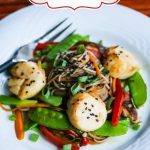 The first time I made this Stir-Fry Shrimp with Thai Roasted Chili Paste, I couldn’t believe how quick and easy it was to prepare. The flavors are rich and deep – I almost felt like I was cheating. 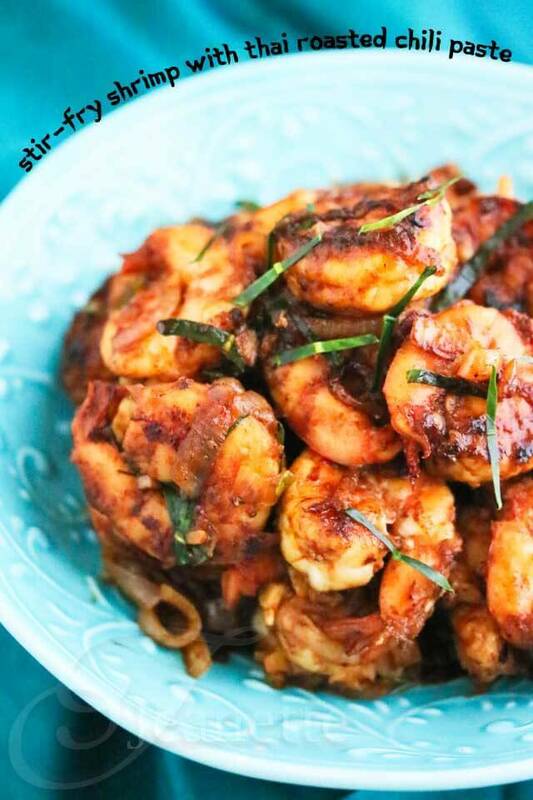 I prepared this shrimp recipe for #ShrimpShowdown to highlight the work that The NFI Shrimp Council is doing to promote sustainable shrimp as a nutritious and delicious protein. NFI and its members are committed to sustainable management of our oceans and being stewards of our environment by endorsing the United Nations’ Principles for Responsible Fisheries. Shrimp can be part of a healthy diet. 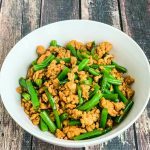 It’s a lean protein and a 3-ounce serving (e.g., 4 large shrimp) weighs in at less than 85 calories, 1 gram of fat and nearly 20 grams of protein. 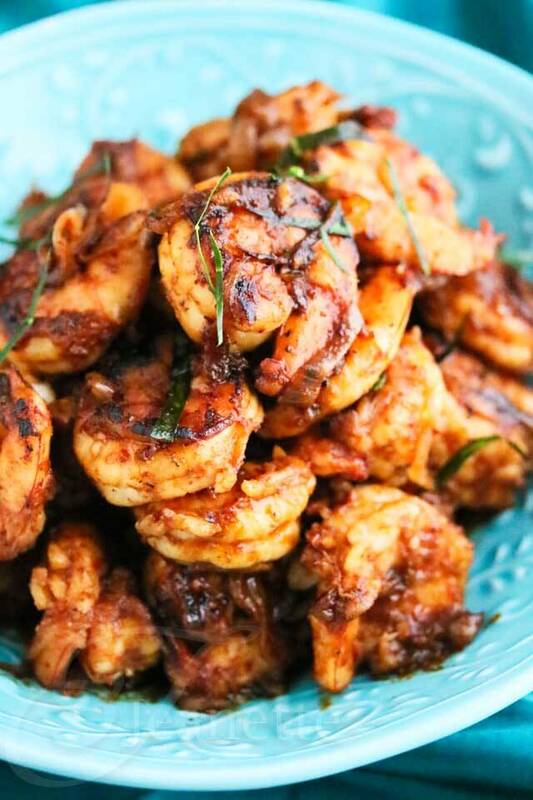 Shrimp is also a good source of B12 vitamins and an antioxidant called selenium. OXO provided some cool kitchen tools to help prepare the unpeeled shrimp that Eastern Fish Company (a member of the NFI Shrimp Council) provided for this event. 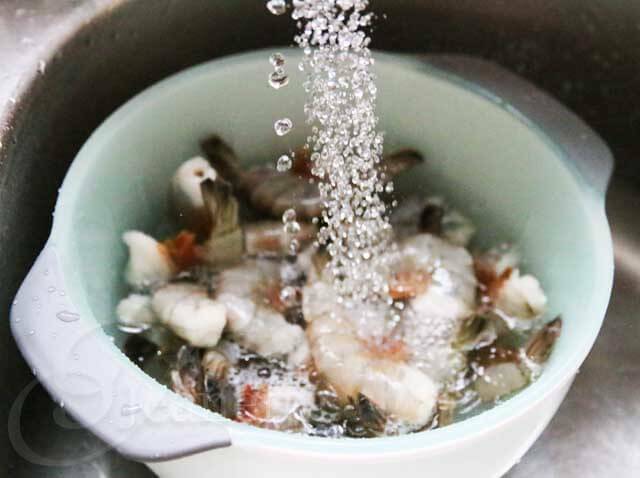 The Colander/Bowl/Lid set was great for washing the shrimp and storing the peeled/deveined until I was ready to cook it. This nifty shrimp cleaner made it so much faster to peel and devein the shrimp (watch my video to see how). and the Kitchen and Herb Snips made cutting the kaffir lime leaves into fine shreds a cinch. You’ll have a chance to win a bunch of prizes including a Shrimp Cleaner, Flexible Kitchen & Herb Snips, Silicone Steamer, Wooden Lemon Reamer, 3 Piece Bowl and Colander Set, 12″ Tongs with Silicone Heads and a $100 Visa Gift Card from the NFI Shrimp Council. 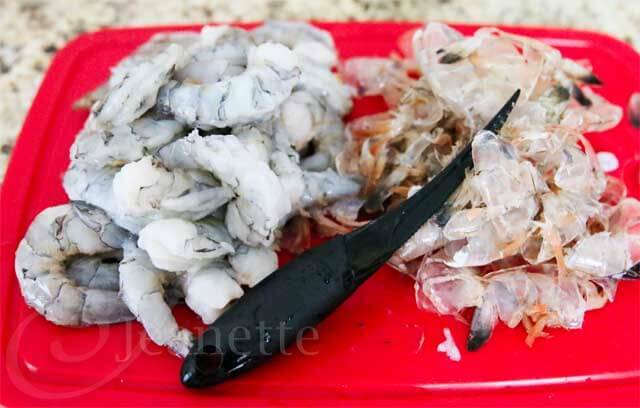 Watch this short video to see how you clean and devein shrimp using the Shrimp Cleaner. 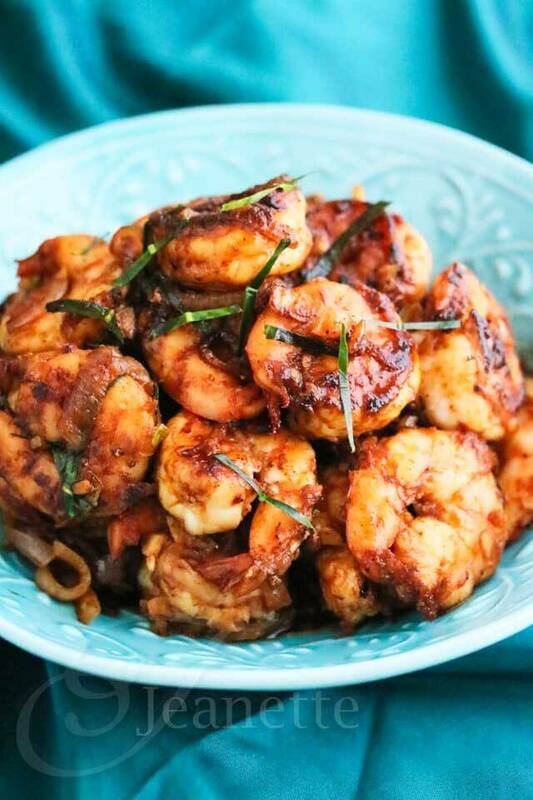 Watch this video to see how to make this Stir-Fry Shrimp with Thai Roasted Chili Paste. 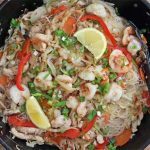 You can check out all the shrimp recipes that were created for this challenge on the #ShrimpShowdown Pinterest Board. Heat wok or large skillet over medium heat. Add oil and heat. Add garlic and onion and stir fry until fragrant and onion is just softened. Add shrimp and toss; add Roasted Chili Paste and toss with shrimp. Stir fry until shrimp is cooked through. Add fish sauce and toss. 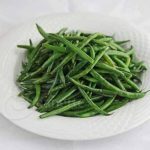 Sprinkle in kaffir lime leaf slivers. Serve. Disclosure: I received a set of OXO kitchen tools and shrimp from Eastern Fish Company to develop this recipe. All opinions are my own. I’m still very much in the process of learning how to cook Thai food. I’ll have to look out for that game-changing chili sauce! This dish looks pretty great. You could almost see how much flavor is in the dish from all that sauce sticking to the shrimp! 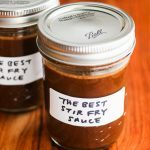 Thanks so much Amy – the sauce is the best! Thai cooking isn’t hard once you become familiar with the ingredients. I love the vibrant flavors. Pardon me while I wipe the drool off my keyboard. This looks so good! Leah – so glad you like this! 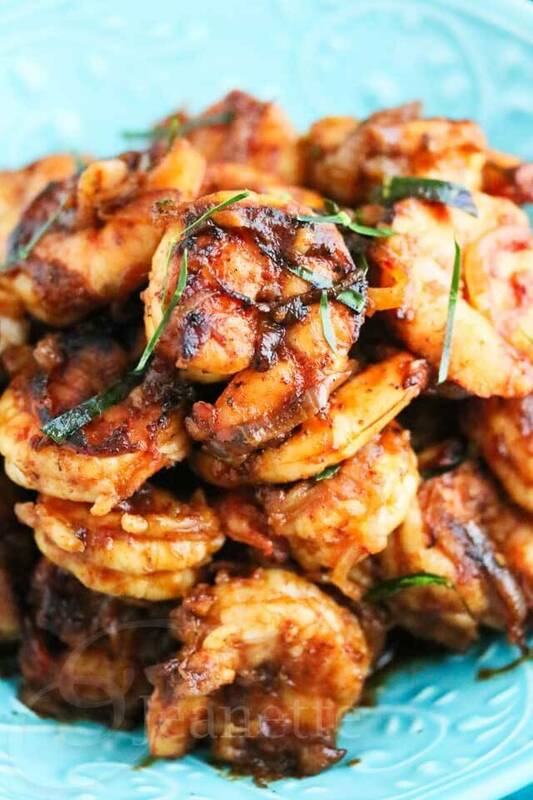 Such GORGEOUS, spicy shrimp, Jeanette! It’s making my mouth water! Thanks Liz – yes spicy and sweet! Jeanette, love these photos, that water falling from the tap is –wow! 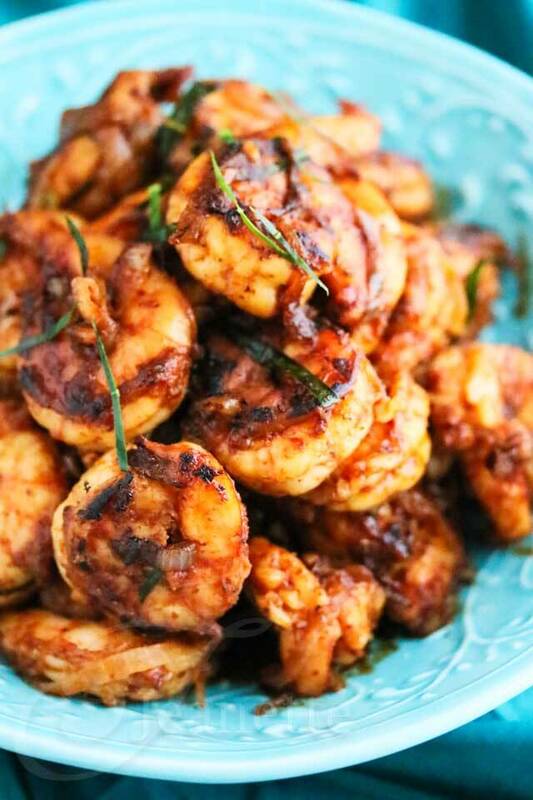 Speaking of WOW – Your shirmp with roasted chili paste is simply WOW too! Love the flavors! Thanks Sashi! Had fun taking photos of this dish! have to explore more on thai cooking now! Corgimas, Thai cooking is really not hard once you get to know some of the ingredients. I love being able to make Thai dishes at home. Especially since our move and I have yet to find any Thai restaurants near us. This looks perfect. It’s so nice when you can just cook what you like at home isn’t it! Oh yum – there is nothing I like better on anything than chili paste! 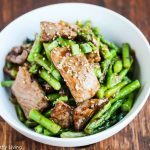 And stir fry is such a great weeknight meal, too. I couldn’t agree more Camille! 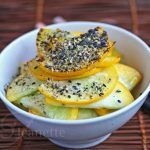 So nice and simple and so tasty! I bet the flavors are just amazing in this! Major bonus points for how easy it is. Me too, I love Thai food and can eat it everyday! I’m working on my and my kids’ spice level so that we can eat more spicy food (while my husband loves extra extra spicy food). This sounds really delicious! 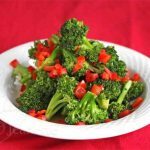 I love Thai food and have a few recipes I make at home, but I’ve never used lime leaves. I’m so excited to try this! It sounds completely delicious! Lovely photos too! 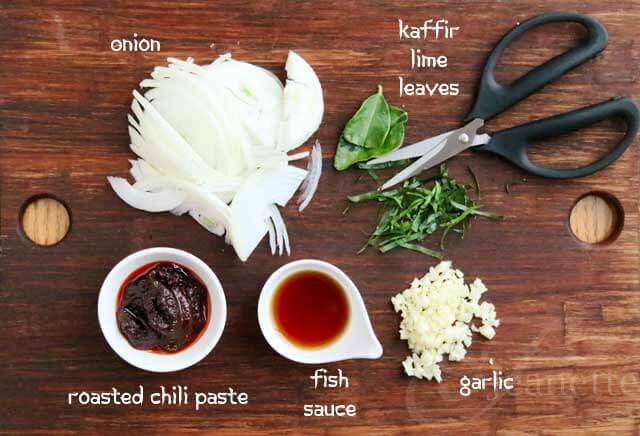 Caroline – if you can get your hands on kaffir lime leaves, you won’t be disappointed – they are so fragrant. I have all the ingredients for the sauce, now I just need to pick up some shrimp. Lovely!